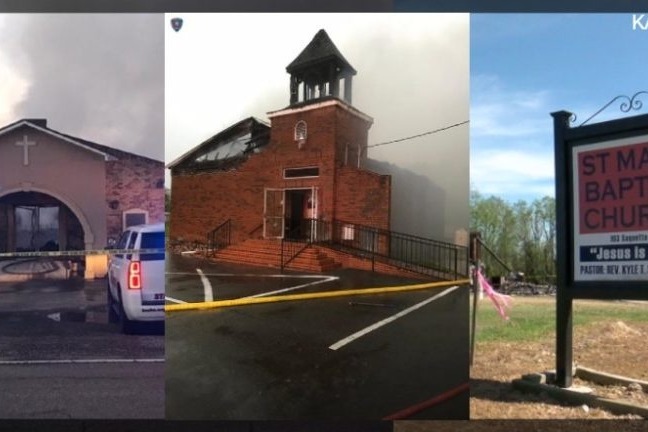 Three historically black churches have burned in less than two weeks in one south Louisiana parish, where officials said they had found “suspicious elements” in each case. The officials have not ruled out the possibility of arson, or the possibility that the fires are related. “There is clearly something happening in this community,” State Fire Marshal H. Browning said in a statement on Thursday. The host of this campaign is the Seventh District Baptist Association, a 149 year old non-profit religious organization. We are working with the Governor of Louisiana, local leaders, elected officials, the impacted churches and their pastors, other faith organizations and the community to ensure 100% of all funds raised will be evenly distributed to the three churches affected. Please donate here and look for upcoming opportunities to help these churches and communities begin to heal. The Seventh District Baptist Association lead by President Freddie Jack, is comprised of approximately 60 Baptist churches from seven parishes in Southwest Louisiana, which includes the three churches affected by the recent fires. The District meets on a quarterly and annual basis emphasizing Christian Education, Evangelism, Discipleship and fellowship in the Body of Christ. The District's annual session is held the first week in June where we celebrate our legacy and plan continual ministry events to reach the lost and edify the Saints. The District will be holding its 149th Annual Session in Lake Charles, Louisiana the week of June 2nd. President Jack requested that a Go Fund Me campaign be initiated to show our support for our church families and the communities affected. We are unequivocally committed to aiding our Sister Churches. The donations received are earmarked specifically for the Seventh District's member churches - St. Mary Baptist Church, Greater Union Baptist Church and Mt. Pleasant Baptist Church. All of your generous donations will be disbursed equally among all three churches for not only rebuilding their sanctuaries, but for the purchase of all necessities lost in the fires, including pews, sound system, musical instruments, etc. Seventh District and the Pastors and congregations of the St. Mary Baptist Church, Greater Union Baptist Church and Mt. Pleasant Baptist Church thank you and solicit your continual prayers and support as we will overcome this tragedy together because we are ONE BODY IN CHRIST! We will ensure that any donations mailed will be disbursed to the three churches equally. Please see the short videos from Seventh District President Freddie Jack and Pastor Harry Richard of the Greater Union Baptist Church. To Everyone, Thank you for your overwhelming support through donations, prayers, kind thoughts, messages and offers of service to restoring St. Mary Baptist Church, Greater Union Baptist Church and Mt. Pleasant Baptist Church. We have surpassed our goal thanks to your generosity. God has truly been glorified throughout this campaign. We are truly thankful and grateful to God for the outpouring of support received for this campaign from all 50 states and 40 countries. With that said, since we have exceeded our goal, we will stop accepting donations through this go fund me campaign, but the campaign site will remain in order to keep you updated on the building progress for each church. Your contributions will be distributed equally to the three churches and utilized by them, not only in the building of their new sanctuaries, but also for the purchase of pulpits, pews, baptismals, instruments, bibles, hymnals, etc. "God proved His love on the Cross. When Christ hung, and bled, and died, it was God saying to the world, 'I love you.'" Formal charges have been filed against the man accused of burning three African-American churches. Holden Matthews, the 21-year-old white son of a St. Landry Parish Sheriff’s deputy, was formally charged with two counts simple arson, one count aggravated arson and three counts hate crimes. His attorney entered a not guilty plea, as is required in an arraignment. The St. Landry Parish District Attorney is prosecuting the case. The DA filed a motion asking that bail be denied, stating that Matthews is “an imminent danger” and should be held without bail until his trial. Matthews was formally charged during a bail hearing Monday morning; he wasn’t physically present but attended “via television,” the minutes of the hearing state.